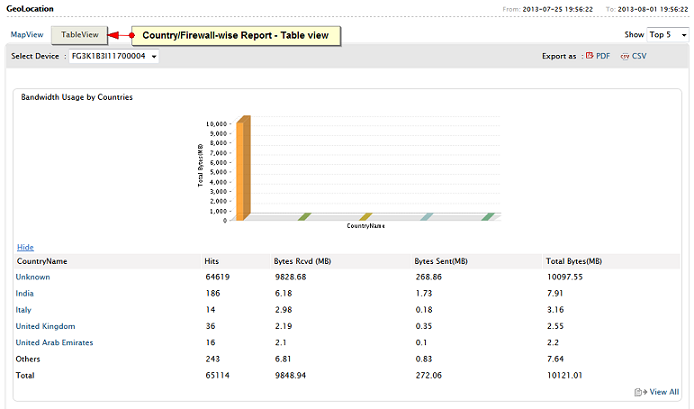 The Geolocation Reports are available for all Firewalls. This section presents country based bandwidth consumed and security reports in map and tabular view. Click the Geolocation sub-tab to get the Geolocation reports. 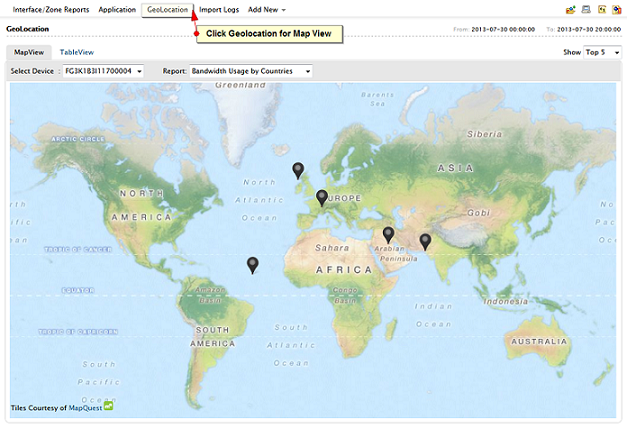 The Geolocation reports consists of two sections, Map View and Table View. The map view displays the traffic from different countries around the globe through the selected firewall. Hovering on the map pins will show the details in the tool tip. Clicking on the pin wil display the traffic information through the friewall from the selected country in table format. The table columns are, COuntry Name, Hits, Bytes Received, Bytes Sent, and Total Bytes. By default top 5 countries are displayed and click the View All menu link to view all the countries data. Apart from country-wise bandwidth information, you can get security reports. On the top the report is displayed in graphical format and in the tabular format the country-wise hits are displayed for each report.